The Greenman or Jack O’ The Green pops up a lot around here, so long before the lower level’s construction in my home began, the idea of having The Greenman Pub as the focal point of the area was a certainty. I like the idea of having a room evoke a feeling as soon as it is entered and hold it. The Pub has an old world gentlemen’s domain aura about it, which sets it apart from the eclectic-rustic feel of the rest of the house. The theme is Irish/Scottish to honor the ancestry of my husband and I, so in addition to the Guinness and Scotch touches, there are black and white photographs of generations past lifting a pint, sporting kilts, and posed before castles, hanging on the walls. This is where friends and family gather when we entertain. Whether at the pub table or at the bar or seated comfortably on the sofa or lounge chair, the atmosphere soon takes on the appearance and feel of being in another time and place. Yes, there is a large screen TV, but it is frequently tuned to a Celtic music channel so, drink in hand, a wee bit o’ dancin’ or a rowdy sing-a-long may occur. Fists dive into bowls of snacks and the jars of candy scattered about, a book might be selected from the library area or one may sit near the tank of Koi, who lazily watch through the glass. The food table offers the whim of the cooks of the house and is served buffet style. In the Summer, the action spills over onto the patio outside via an open window that allows the conversation to flow back and forth. The photo above is at the entrance to the pub as you leave the second level of the house where the foyer and great room are located, and go to the lower level. Yes, the tall need to duck a bit due to the stairs, but I pass under with ease. In case you are wondering, all the canopy is, is a domed plastic window well covering that can be purchased from any hardware store for about 6 bucks. I roughed it up a bit and applied a copper finish paint and patina from a kit. Then I added the Greenman face, constructed from a plastic mask overlayed with a print. 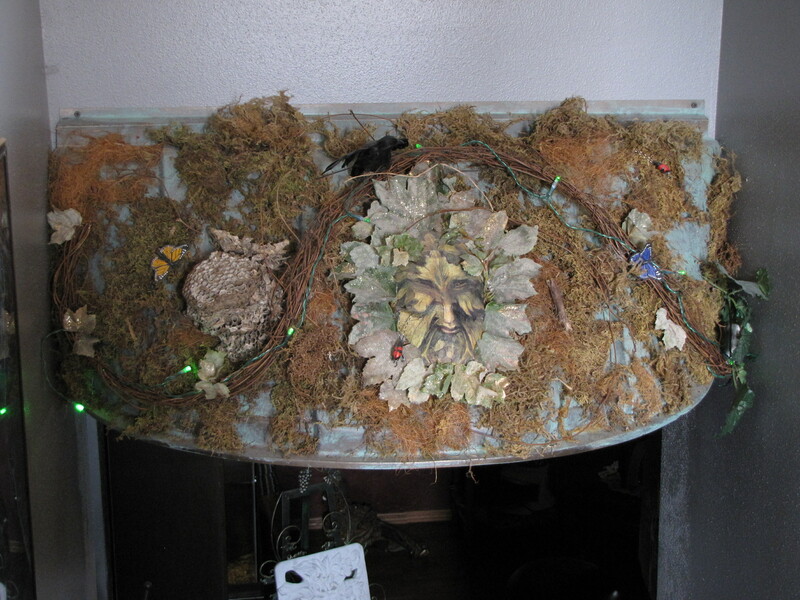 Moss and other finds from the craft store were applied with a hot glue gun and a string of green battery operated lights was added to make the Lord of the Forest feel at home. This canopy can be done in any theme and hung over a doorway by just screwing the lip of the cover to the wall. Turn the entrance of a child’s room into something special or your closet into a trendy boutique by adding paint and a few touches of glitz. Fringe can be applied to the edge for added glamour. Don’t forget the guys. This can also be used over the door to the ‘man cave’. Have fun and get creative with your Magickal space. Your home is a reflection of you. Make it personal.